In a world fractured by the war machines of capitalism and exploitation, it is all-too-easy to feel distant from the stories of violence that pervade our media and political histories. 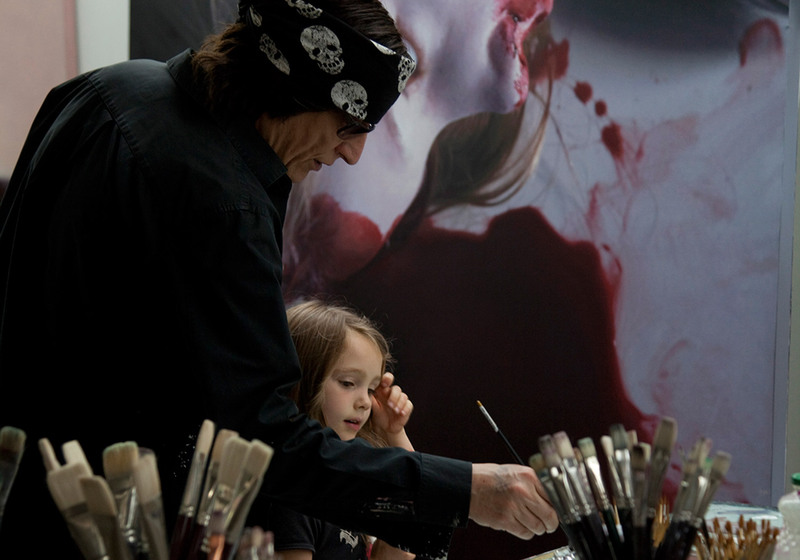 However, as the renowned artist Gottfried Helnwein has shown in his courageous and provocative work, it is extremely difficult to ignore the suffering of a child, whose pain and stolen innocence exposes the failure and cruelty of the system. 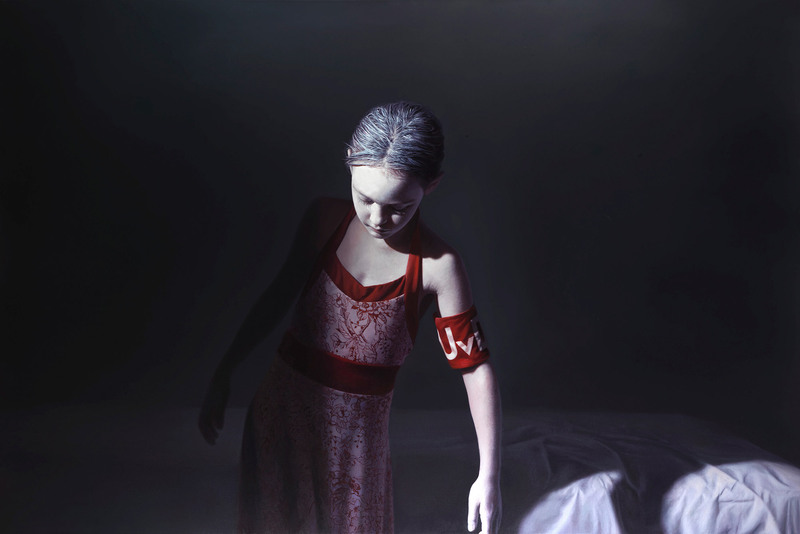 After growing up in post-Nazi Vienna, Helnwein began exploring the theme of the wounded child in the 1970s as a protest against the silence surrounding the war atrocities. 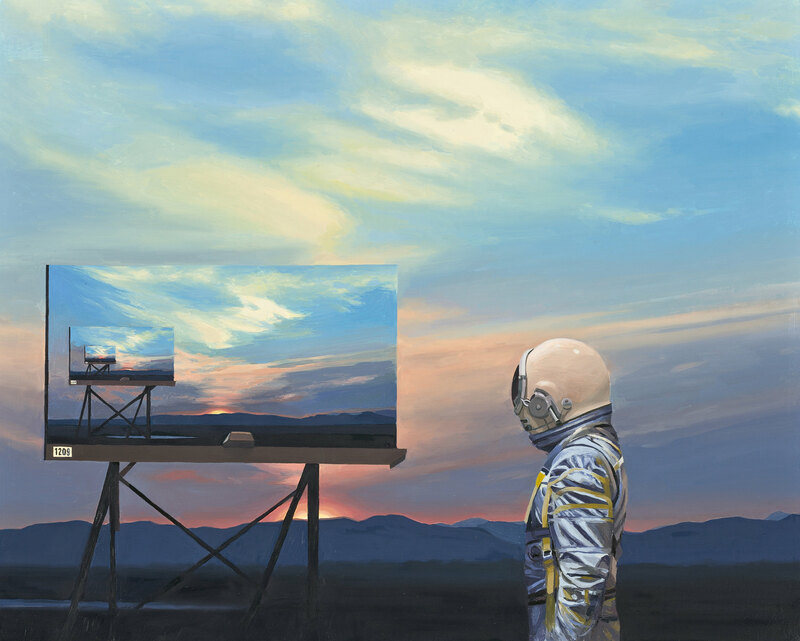 Since then, he has worked extensively in paint, photography, performance art, sculpture, and other media, developing a disturbing-yet-beautiful iconography that has shaken the art world to its core. 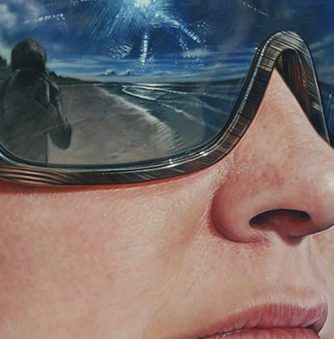 Among his many internationally exhibited and acclaimed works are the “Disasters of War” and “The Murmur of the Innocents” series, both comprised of large-scale hyperrealistic paintings of children. 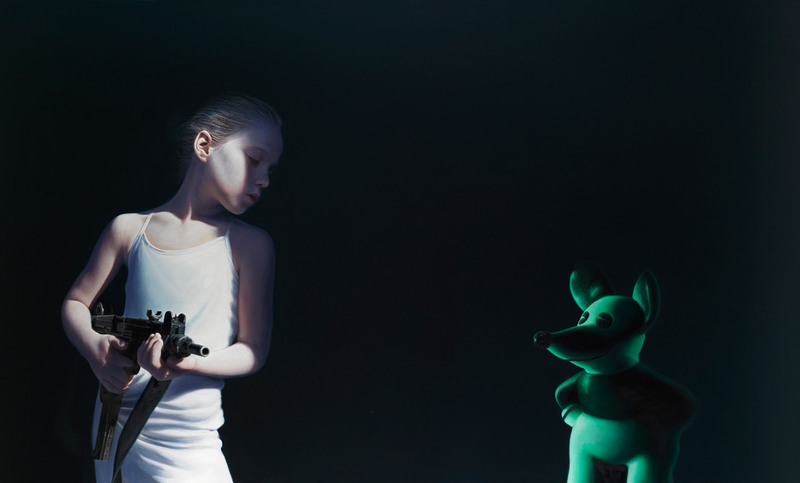 By mixing together images of children, torture, and cartoon characters, Helnwein uncovers stories of extreme pain (both physical and emotional) and enduring virtue, as well as the way mass-media culture (i.e., Disney) has replaced childhood innocence with manufactured, emotionally-bankrupt mascots. 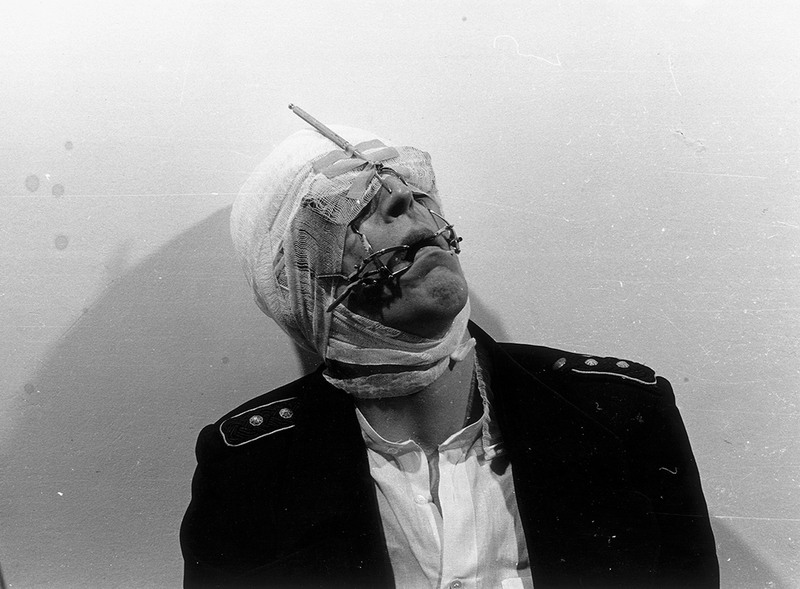 In a series of photographed self-portraits he made in the 1970s and ’80s, Helnwein made himself the torture subject, applying bandages and bizarre apparatuses to his face. 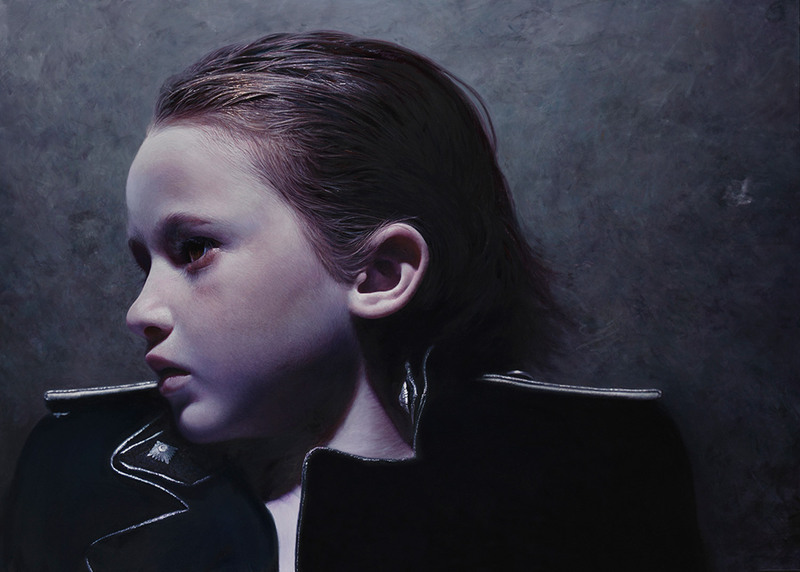 Confronted by these works, the viewer cannot help but to feel the pain Helnwein and his figurative children embody—and that is the artist’s goal. 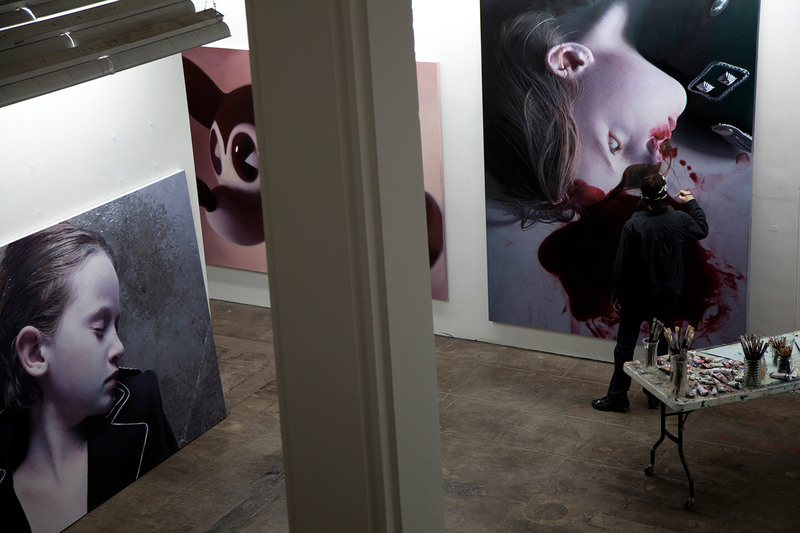 At age 68, Helnwein remains active in both his politics and art. I had the honour of asking him a few questions about his past and ongoing work, his views on violence in the media today, as well as his connection with the late David Bowie. 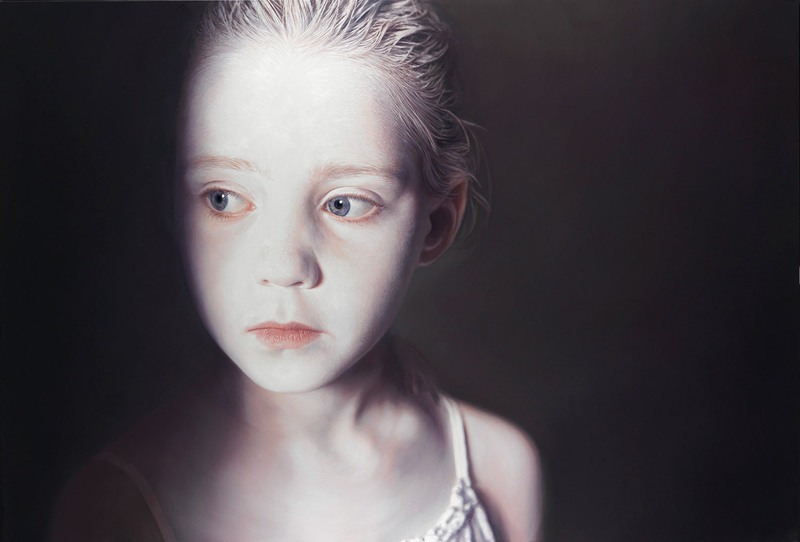 Top: Helnwein uses shadows and light to create a somber mood that reveals the child’s quiet strength. 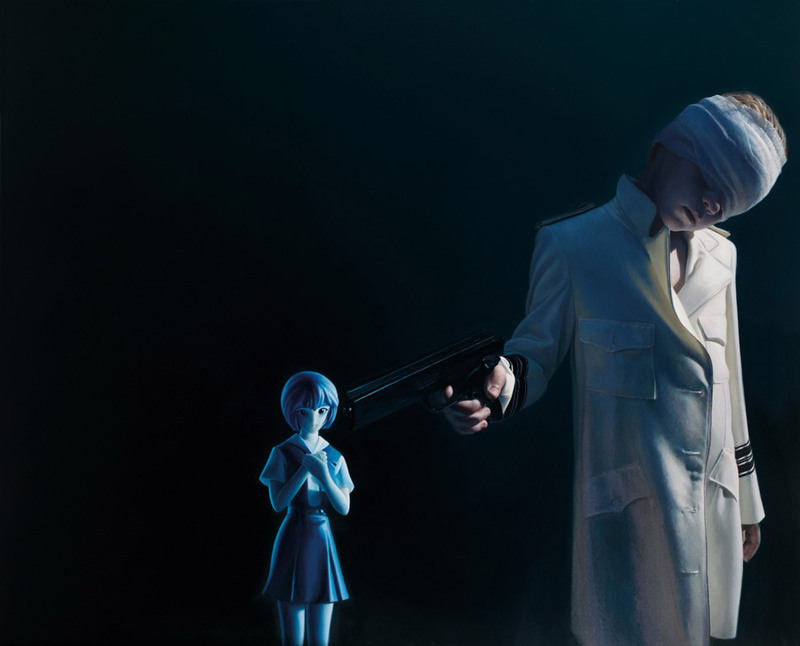 The cartoon characters in Helnwein’s paintings have a dark and unsettling demeanor. At age eighteen you began creating art as a means of questioning authority. How do you enact resistance through your art today? I always wanted freedom and independence more than anything else. I want to look for myself, think my own thoughts, dream my own dreams, I want to draw my own conclusions, and to make my own decisions. I don’t need any belief-system or self-appointed authority to tell me what to think, what to do or not to do. I was never violent; I am no danger to society in any way—so I don’t need to be monitored and controlled by anybody. I can take care of myself. Unfortunately, the last thing any human society wants are free beings. Don’t wait for somebody granting you freedom, it will never happen; if you want freedom, you have to seize it. Creating art is one way of doing it, and for me it’s the most effective way. Nothing scares authoritarian regimes more than art and free creation. Why would Hitler burn mountains of books and paintings and ban all arts? Why would Stalin—the master over life and death of almost 300 million people, a man who commanded the biggest army and secret service that ever existed—be afraid of the poems written by Anna Akhmatova? Why would Mao be so obsessed with destroying China’s entire cultural heritage? Why would FBI director J. Edgar Hoover, while denying the existence of organized crime in the US, put so much effort into harassing and investigating every artist of any significance from Hemingway to John Lennon? On this planet, creating means to stand up, to rebel, to resist, it means striking back. The bandaged eyes inspire pity for the child’s vulnerability, and the gun signifies the perpetuation of violence. You’ve described your work with the following statement: “My art is not the answer, it is rather a question.” What fundamental questions do you hope viewers will ask themselves, their political systems, and the world itself? That’s entirely up to the onlooker. 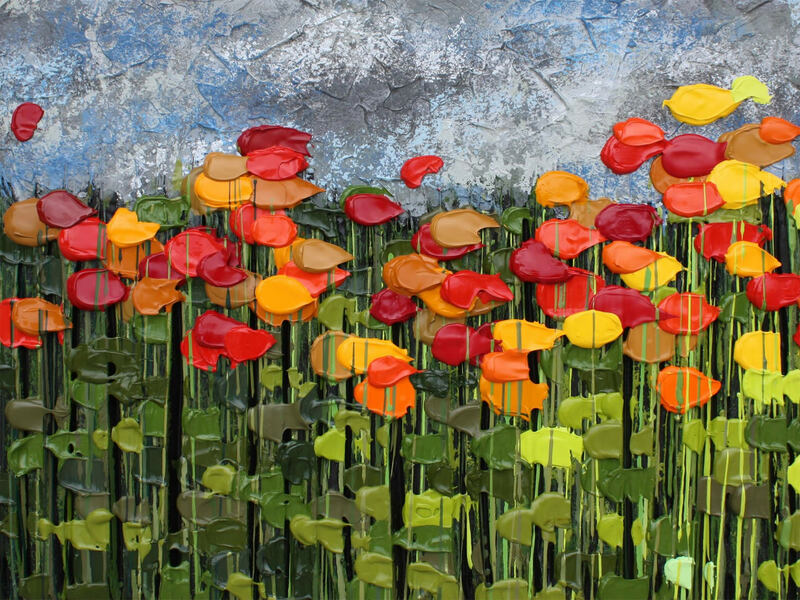 In all the years I have shown my work, I have seen people reacting very emotionally to it. 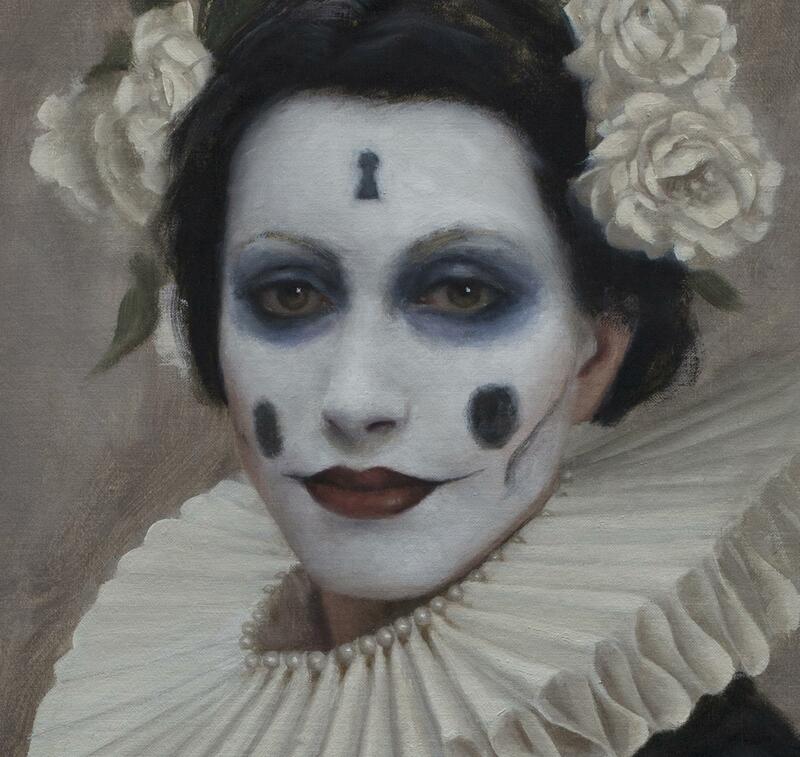 Curators are always amazed when they see people in a museum crying in front of one of my paintings. It seems that at times my images tend to touch sore spots. The children who avoid the viewer’s gaze seem to be staring into another world, dissociating like the survivors of trauma. The world has changed so much in the years you’ve been active, but in many ways it has stayed the same, with xenophobic politics and civil wars. What global trends or events are biggest on your radar when it comes to the production and sharing of your art? What we are experiencing right now looks to me like the ending of a civilization, the second Fall of Rome. Children walk into schools to shoot other children, others blow themselves up in the midst of a crowd. Almost every hour an American soldier or veteran kills himself, which means that the majority of American soldiers die through suicide, not in combat. As far as I know, that never happened in history before. It looks like the death wish of a society for which life lost its meaning. This bloodied and serene child resembles a martyr who has suffered immensely in the forces of war. I’m certain you’ve seen it: the image of the Syrian boy covered in dust and blood that went viral recently. It stirred up a lot of discussion and emotion on social media. However, as The Washington Post observed, “despite an outpouring of global woe and lamentation, little changed.” In your opinion, what makes such photographs so ephemeral, and why does the greater public so easily sweep them under the rug of social consciousness? 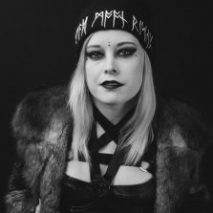 We are bombarded daily with an endless flood of horrifying graphic and pornographic images of violence and death on television, social media, internet, movies, and video games, which is just overwhelming and desensitizing, leaving people with a feeling of utter numbness and helplessness. Since WWII the western war-machinery has never stopped killing. It keeps invading, bombing, torturing. The standard solution to any problem with regards to foreign affairs seems to be: threatening and “bombing them back into the Stone Age.” All in the name of “Democracy.” Of course, none of these campaigns ever solved anything; they only created new bigger problems and left scorched earth, blood, tears, and millions of corpses. But war is good business, and as long as we are ruled by bankers and the insatiable military-industrial complex, nothing will change. 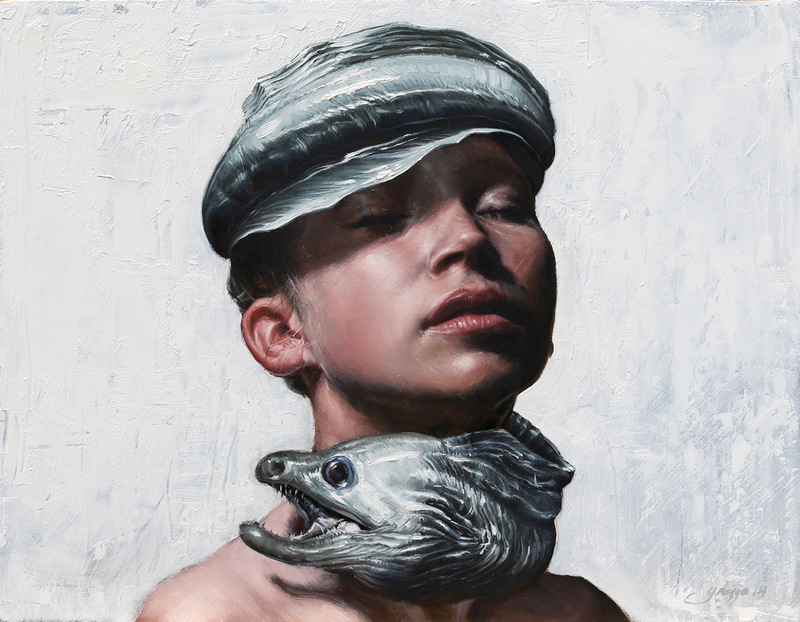 Helnwein’s large-scale paintings deepen their impact on the viewer. Your works have maintained an impact since the ’70s—what makes political paintings timeless, compared to the images we see reproduced on social media? In 2002, when I moved into my new studio in Los Angeles, I thought for a moment: maybe painting is a completely anachronistic activity. How can a traditional simple painting compete with all these powerful special effects of the omnipresent electronic media that permeate every aspect of our daily life? 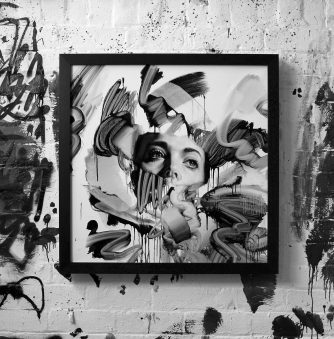 Would anybody in all this noise and hype bother to look at a painted piece of canvas? 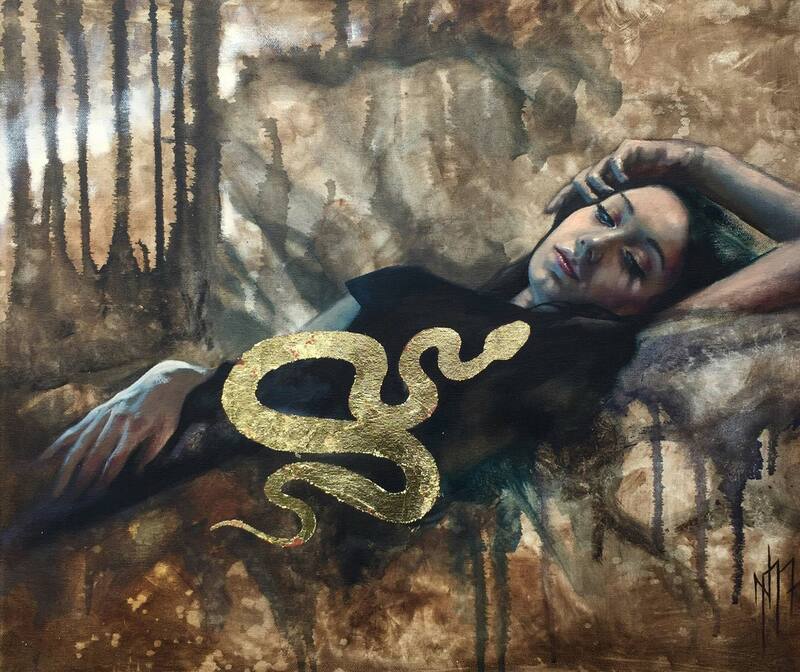 And then at my first American museum solo show at the Legion of Honor in San Francisco, something totally unexpected happened: I saw the most emotional reactions to my work that I have ever experienced. People spontaneously came up to me and hugged and thanked me, and some cried. A woman said to me, “You probably don’t even know how important it is that you show your work here and right now.” I was taken totally by surprise, and I was somewhat humbled. It seems that a piece of art can have a much deeper impact than mass media with all its might and sophistication. This painting from “The Murmur of the Innocents” shows both fear and bravery in the child’s face. In your paintings, I’m fascinated by the deep, complex messages in the children’s eyes—they seem calm and distant, almost as if they have transcended their pain to give the viewer a message. What is the impact of painting unsettling expressions on the faces of suffering children, as opposed to adults? 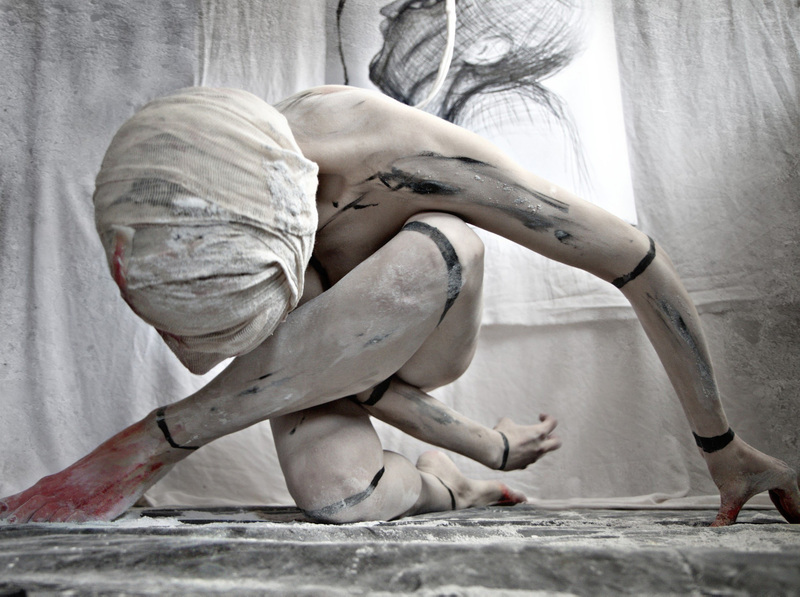 My work is about the human existence. For me the basic nature—the essence of a human being—is manifested in its purest form in a child. Injustice, abuse, injury, and violence are most evident and unbearable when inflicted upon a child. Anybody who is not completely insane will feel an impulse of empathy and sympathy and the urge to protect, to help, to console. At the same time, children are exposed every day to the horrors of the grown-up hell they have to live in. It was the image of the wounded child that haunted me so much that one day I started to paint it, and I continued painting it—over and over again. I don’t know, maybe I wanted to force others to look at it, too. 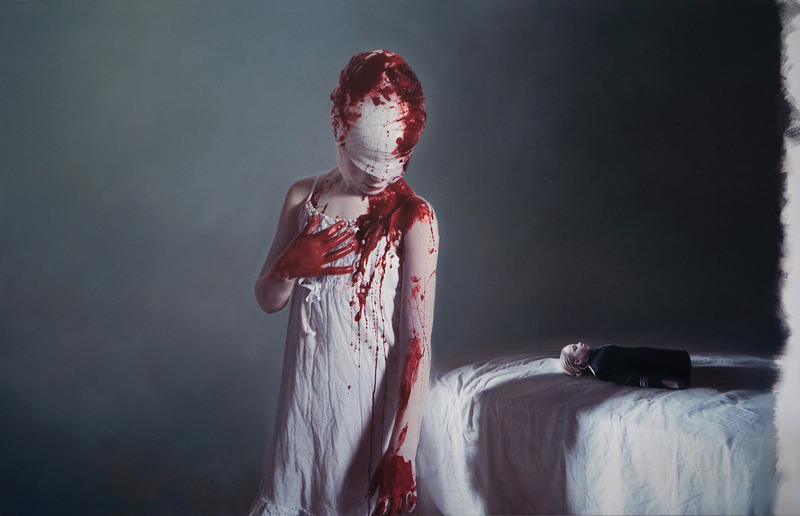 Helnwein’s self-portraits explore vulnerability and the experience of being both a victim and a martyr. On a lighter note (but still tinged with sadness)—your screenshot of David Bowie garnered a lot of attention on your Facebook feed, with people saying that they saw a lot of similarities between “Lazarus” (his final video) and your style. 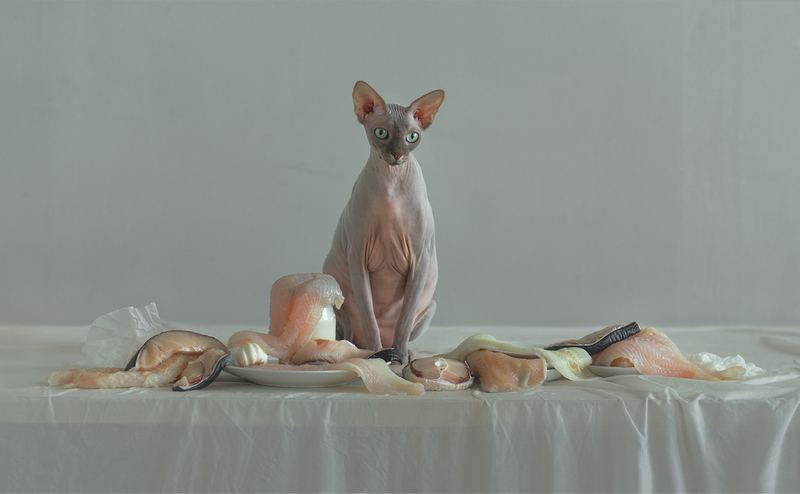 Your studio clarified that “while Gottfried was not involved in the making of the video, . . . it certainly looks like he helped inspire it.” In what ways do you read similarities? Bowie was an exceptional creative being. Only he could transform death into a work of art and say goodbye with such a brilliant and touching last performance. 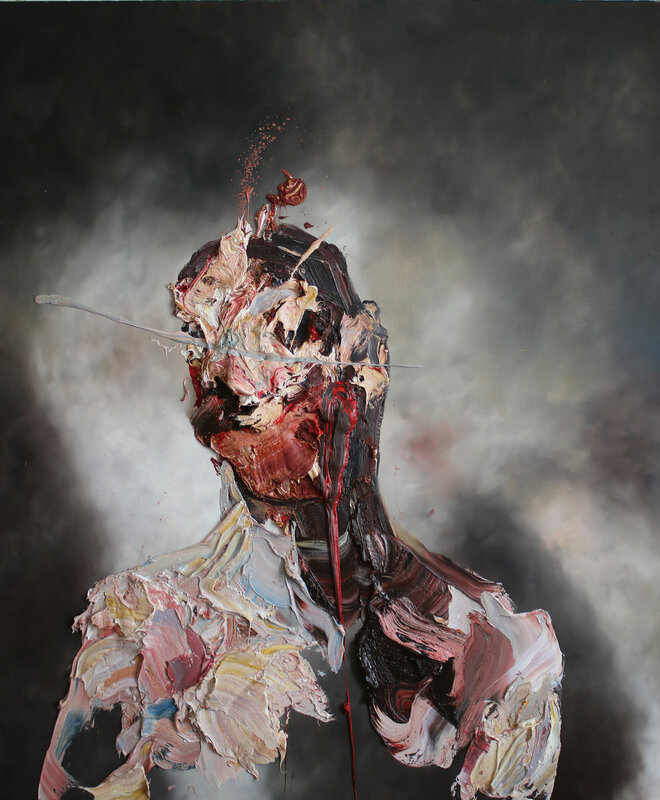 His bandaged head reminded some people of my self-portraits in which I bandaged and distorted my face in endless variations—starting with my early performance and photographs in the seventies, and later also in my paintings. I met David in the ’90s in Los Angeles several times—he knew my work. I don’t know if my pictures were an inspiration for his “Lazarus” video, but I’d feel honored if it was. 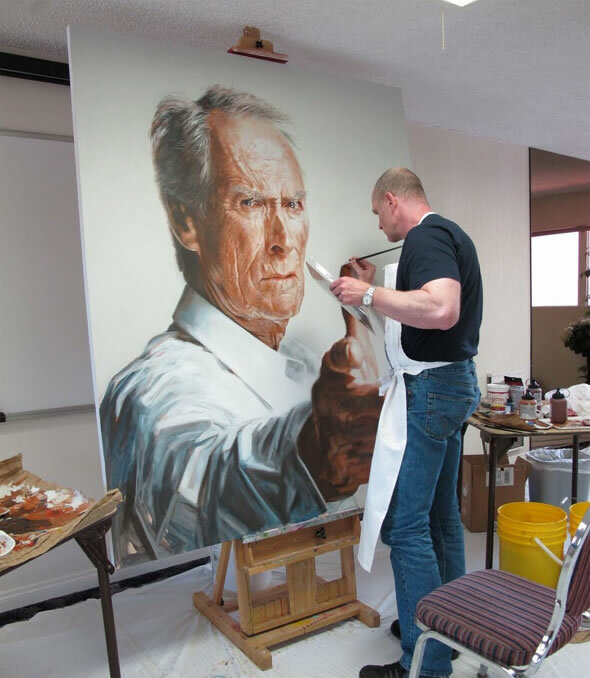 There is much to see and learn from the ongoing projects of this living legend. Do you have any collaborations, projects, or exhibitions that we can look forward to seeing from you in upcoming year? I am struggling with many ideas, but nothing concrete enough that I could tell you now. Usually I don’t plan too far ahead; I think I would hate to know where my work will end up in the future. I want to be surprised, too. I can only suggest: stay tuned. 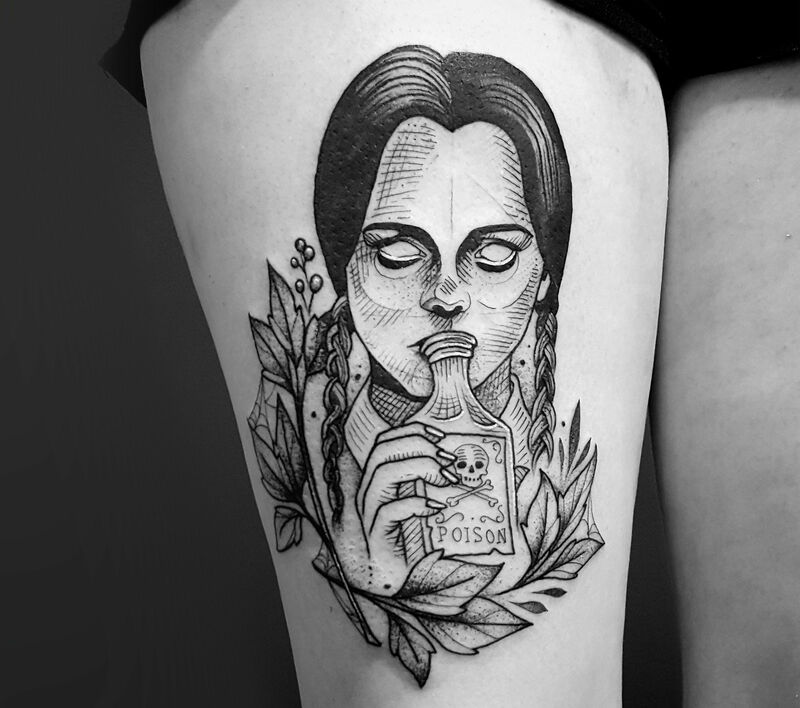 Follow the artist on Facebook and Instagram.